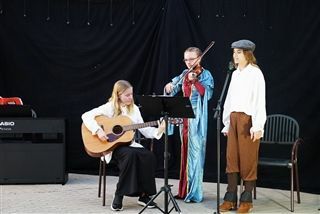 On October 30, the campus turned into a Renaissance fair for the Middle School Shakespeare Festival. Seventh graders showed their knowledge by cooking fabulous food from the era, putting on a shadow puppet theater and role playing con artists, servants and merchants. Eighth-grade English classes put eloquence and passion into scenes from Romeo and Juliet. Each scene had its own distinct setting and theme, such as a boulangerie in Paris, characters from Harry Potter and a Montague biker gang vs Capulet surf crew. Students thoroughly enjoyed the festival!